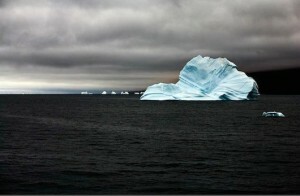 Photo credit: GROUNDED ICEBERG, Camille Seaman, East Greenland 2006. Is gender revealed by these works of art, and is there a distinctive eco-feminist approach to environmental concerns? The phrase, “women’s unique perspective” appeared in the ‘Call for Entries’ to WEAD members to submit works of art for the “Smaller Footprints” exhibition that addressed climate change. The urgent need for humanity to curtail its current scale of activities suggested by this theme is encapsulated in the phrase “smaller footprints”. This metaphor provided the title for the exhibition, and it was also applied to the physical limits of the works of art in the exhibition. Each artist actualized a smaller footprint limiting her work to …” x …”. The artists’ willingness to accept this limitation models the reduction in the human use of resources that is required to avert the impending climate crisis. Students and the public are invited to participate in this search for a consensus regarding the uniqueness of women’s approaches to climate change as expressed in art. Visitors can conduct their own investigation by completing a “Gender Inquiry” form. The form presents four categories of art attributes: Subject, Style, Genre, and Attitude. Friday, March 4, 2016 from 2 – 4 pm at MOAH:CEDAR.